Ice Fishing Article, Mixing it Up on Ice. 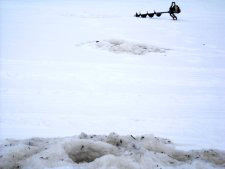 Recently, we as ice anglers have tended toward becoming species specialists. Some like Walleye, others prefer panfish and still others would rather target Pike. You know, that's great, but sometimes I remember growing up fishing with my grandparents and to them, every fish was a good fish. That philosophy stuck with me and even now, I really enjoy those good old fashioned "let's just see what's biting" fishing trips. 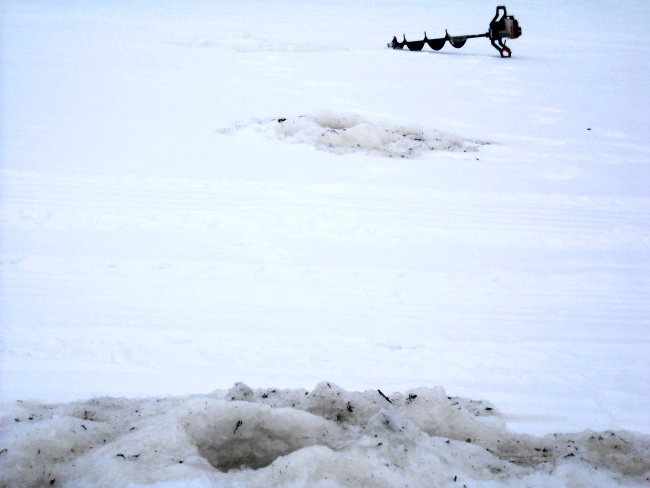 Here's a fun, mixed bag ice fishing pattern that's great for those times when you just want some action! It's especially great for all kids under the age of 85 and has become one of my very favorites. Picking the right area is the key and it doesn't take that much to get pointed in the right direction. Because most of the best mixed bag spots are shoreline related weedbeds, this system great if you're hoofing it because lots of times you can find good fishing areas like this within easy walking distance of a landing. 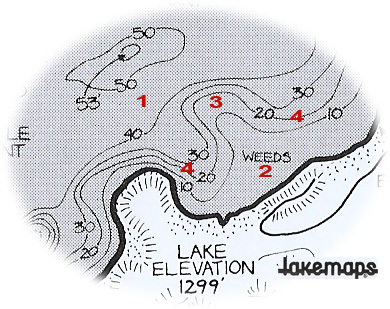 Here's how I get started, take a look at a map of your favorite lake or maybe one that you've been wanting to try. Here's a section of the map that highlights one of my favorite mid-winter spots and shows what to look for when choosing a location. 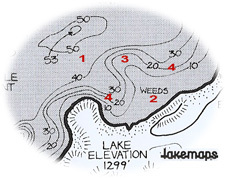 Find the areas where large, weedy flats are located near any of the lakes deeper holes. This location has everything a fish would need to set up housekeeping for the winter. 1) Deep water feeding areas, 2) shallow weed cover, 3) a nice point for feeding during active times and 4) two inside turns or pockets where fish can hold during less active times. Once you start drilling holes, you'll uncover more subtle secrets about the spot like locations of gravel, clam beds and other interesting features. To get in on the best action, I like to be near or even just inside the weedline. I like to start drilling holes in the shallow weeds first, working my way out toward the first drop-off. Most times, I can find the weedline with my Humminbird, but occasionally I'll start by drilling in shallow water where weeds will come up through the hole as I drill. I'll drill each hole a little deeper until I come to the first "clean" hole and use this as my starting point. Drill additional holes along the weed edges and remember to add a few out in deeper water, along the second drop-off too, just in case panfish happen to be roaming near the deeper water. Because every lake has it's own mix of fish, the baits and presentations you choose will depend on what's available where you're heading. On my favorite lake, I've caught Perch, Walleye, Northern Pike, Crappie, Tulibee and even Largemouth Bass all on the same fishing trip. So for fishing here, I'll take along some small fatheads, Eurolarvae, wax worms or grubs to cover the Perch and panfish. Most times, Walleye and Pike will respond to artificial lures tipped with a minnow head, but if I think there's a chance to catch some nice Pike or Walleye, I may even throw in a few larger minnows like Golden Shiners or Pike size Suckers. While I'm searching for fish, I like something a little heavy so that I can drop it in fast, watch for activity on the flasher and then move on if I need to. Northland's Buckshot Rattle Spoons or Puppet Minnow are good baits for searching and depending on which fish I find first, these might be all I need to keep catching active fish. If I think I've discovered panfish or maybe finicky fish that won't hit the aggressive jigging baits, I'll switch over to smaller more subtle presentations. For tricking finicky panfish or Perch, a small #8 or #10 Rat-Finkee is really nice, but you can substitute almost any small ice fly, ice ant or even a plain hook. Start by tipping the lure with a wax worm, grub or small minnow and fish these baits slowly. This can be a great time to fish for Pike with larger minnows, set on the weedline using a tip up. While you're drilling and checking holes for other fish, the tip up is working to help keep you in the action. No matter how you plan to fish, you should prepare to adjust your fishing style according to the time of day you'll be out. On my favorite lake, the evening bite in shallow water is usually when the Walleyes roam. Evening can also be an excellent time to trick finicky Crappie or Sunfish. 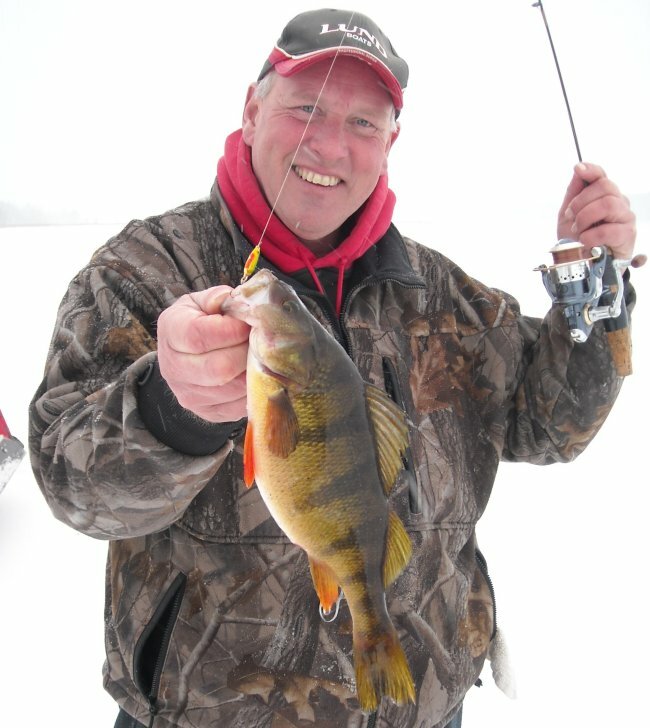 On the other hand, Perch, Bass and Pike may be active during the daytime. So to help keep the action going during the day, continue moving along the weedline and catch whatever bites. As you work the structure, keep an eye on your flasher and make note of areas where you see fish looking at your bait, but don't bite. At evening, take your gear back to the area where you saw the most fish and get set up for the evening run. During last light, I love to jig for Walleyes with a jigging spoon or Puppet Minnow and most of the time, that's what I do. I'll find that the active fish move on to the weedline from the tip of a point that drops into deep water. At times, I might decide that fishing for Crappies out a little deeper sounds like more fun. At these times, move out away from the weedline to those holes you drilled earlier on the deeper drop-off and fish with a small fathead or Crappie minnow. The system is what is, a fun way to spend an afternoon. I've already made it sound more complicated than it needs to be. For me, it's just poking around with the idea that I'm going to be happy with whatever fish I catch. Like grandpa always used to say, "ooh that's a good one"! 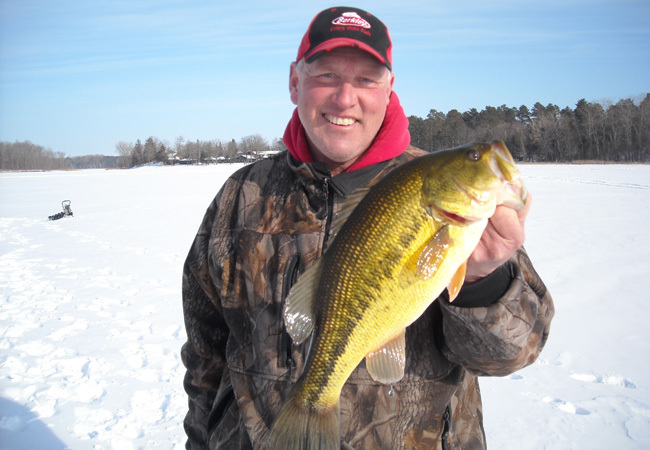 Daytime action on the weedline depends on what's available in your favorite lake. On mine, Perch, like this weedline jumbo, cooperate during the day, but so do Pike and even Bass like the one pictured below. On this spot, I caught at least one Bass on five different occasions. Fishing in the weeds is the secret!. A good starting is a shallow weed flat near deep water. This spot has all of the ingridients to satisfy multiple species. Drill holes starting in the shallow weeds and work out until you find the clean breakline. This is a great starting spot. 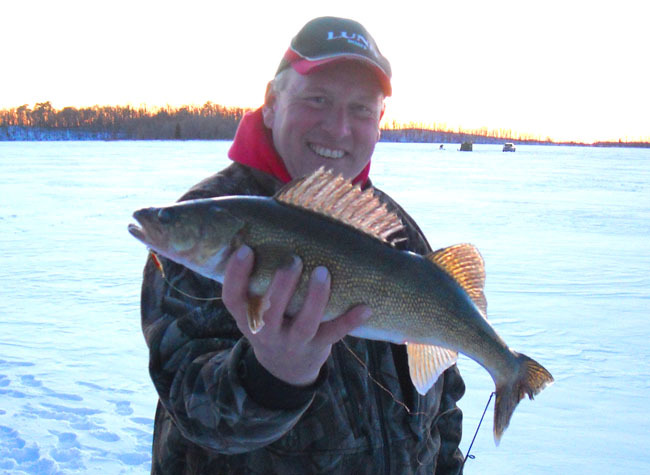 Toward Evening, Walleyes usually get active. Fish with Buckshot Spoons or Puppet Minnows. Have a great idea for an article? I'd like to hear it. You can lend me a hand by emailing me with your questions or suggestions.